Eco art or ecological art, is the name given to a movement among artists who create works with a specific goal in mind: saving the planet. Whether it be addressing plastic waste, deforestation, greenhouse emissions, poaching and destruction of natural habitats- the central message is the same. Our planet, these artists say, is dying- and we have to do something about it. By creating works inspired by this message, they hope to spread the word and show people the destruction they could be causing, or may be complicit in. 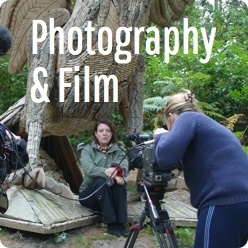 As with all art, eco art can take many forms- with artists expressing these messages through paintings, performances, poems, pictures, films and many more. Sculptural eco art is just one small facet of the movement as a whole, but can provide some of it's most poignant and powerful pieces. Given the very real and physical nature of pollution, waste and environmental destruction sculpture is naturally suited to showing people the impact of these events. As people have as a whole grown more environmentally conscious and aware of things such as climate change and pollution, the movement of eco art has had an increasingly large audience. Although it has exists for a very long time, and artists have long advocated for a better treatment of the planet and their environments, it is only recently that it has really become entrenched in both artistic and public consciousness. Sculptures which share and spread the environmentalist message of eco art have become increasingly common and popular, as the statements they make are seen to extend beyond the artistic and into the practical. The ability of a stunning piece of sculptural art to have an impact on people and really change their behaviour for the better is an eco artists dream come true. Often, sculptural eco art can come in the form of found art- with waste products being reused, recycled or otherwise repurposed to create an environmentally friendly message. Objects such as plastic waste, discarded single-use or disposable items (sometimes called ephemera), non-biodegradable waste or any number of other associated items are all commonly found among eco art sculptures. The growth of eco art is something we're on board with at The Sculpture Park, and we are always looking to ensure that we can operate in an environmentally conscious way. We proudly display eco art sculpture in our park and always recieve a good response from our visitors who are happy to see that we support the movement. Our collection of eco art sculpture is ever popular and always growing, but is by no means an exhaustive collection. In this article, we've put together a list of some of the most impressive eco art sculptures out there, among some pieces currently featured in our park. "Skyscraper" is a large blue and white plastic piece constructed by the Brooklyn based group 'STUDIOKCA'. 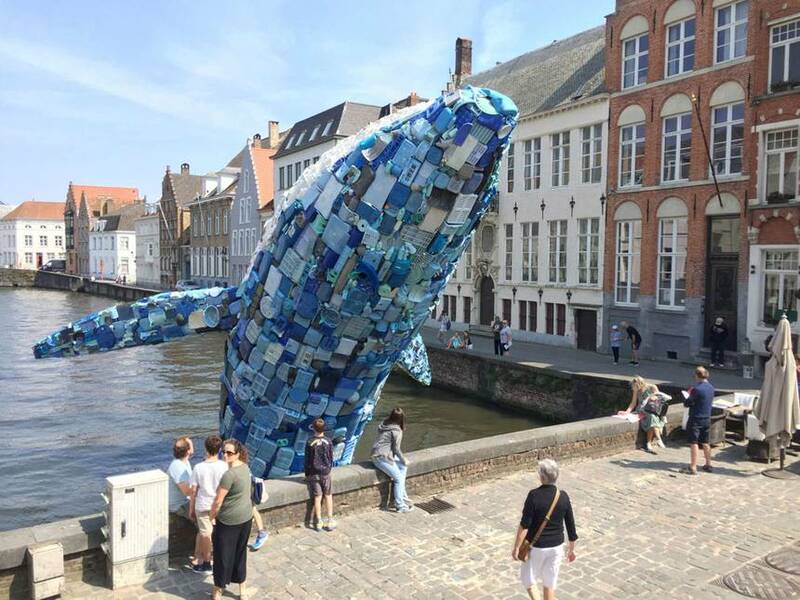 Depicting a breaching blue whale built to life size proportions, it uses over 5 tonnes of coastal plastic waste in it's construction. It is currently on display in Bruge, Belgium. Comissioned for the cities triennial festival in 2018, this piece was created to spread awareness of the ever growing dangers of plastic pollution in our oceans. Despite weighing it at over 5 tonnes, the plastic used in this piece represents little under 0.0000003% of the estimated amount of plastic pollution found on coastal regions and beaches globally. 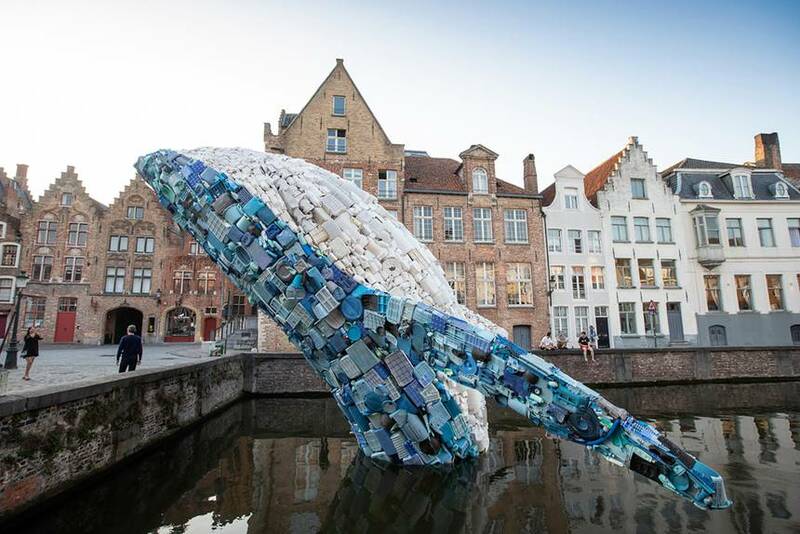 The plastic used in the piece was collected by hand over 4 months from beaches in Hawaii, and from the canals in Bruge themselves. 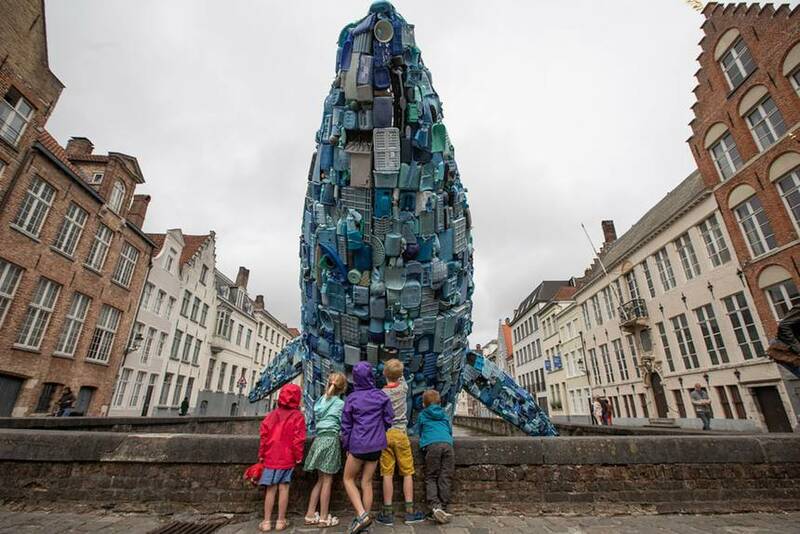 The artists intention was to spread a message to both demonstrate the size and scale of plastic pollution, but also to demonstrate that change was possible. By collecting the plastic used in the piece by hand, with over 5 tonnes in 4 months the artists were demonstrating that through collective action the problem could be reversed. If a handful of people can remove 5 tonnes of plastic waste from the environment in 4 months, then a larger effort could serve to make an even greater impact. Standing at 34ft tall, from the surface of the water, 'Skyscraper' towers over visitors and it's breaching pose allows for viewers to walk below the piece as it arcs over dry land. 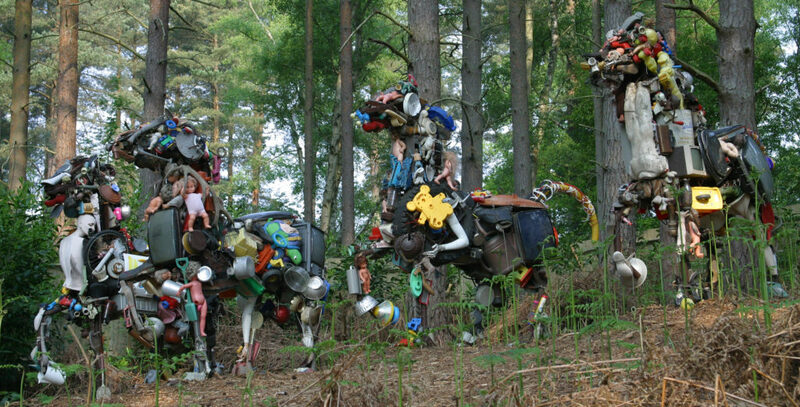 Made of reclaimed and salvaged plastics, metal and found objects, these four horses each stand at around 6ft high. 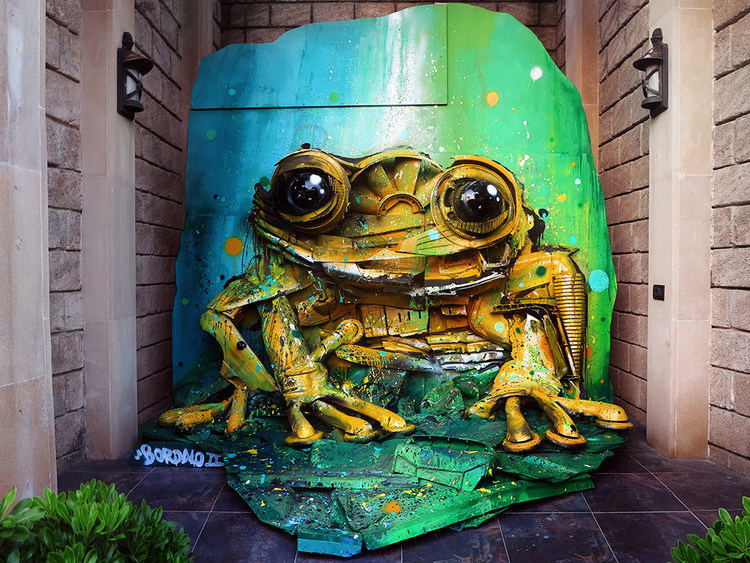 Anthony Heywood's piece takes aspects of an iconic image, and adds an eco art twist. The construction of these works, using discarded plastic and steel alongside salvaged objects creates a powerful meaning. By recreating the form of the steeds of the mythical 'Four Horsemen of the Apocalypse' and removing their human riders, the message shows a bleak future for Earth and mankind if we don't change our ways. 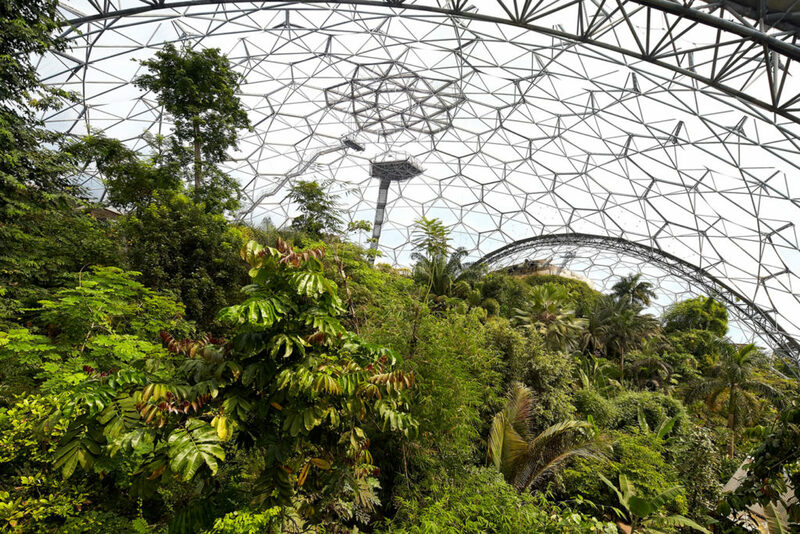 This vision of the future, with the polluted steeds of nature overrunning the earth and leaving no room for humans is a terrifying possibility of where our actions may lead us. Displayed proudly in the park among the trees and wildlife of the sculpture park, with the sound of wind in the leaves and water running in the streams - the works message is even more poignant. The contrast of the apocalyptic form of the steeds and the serenity of their surroundings highlights the harsh reality that may befall our environment if things do not change. 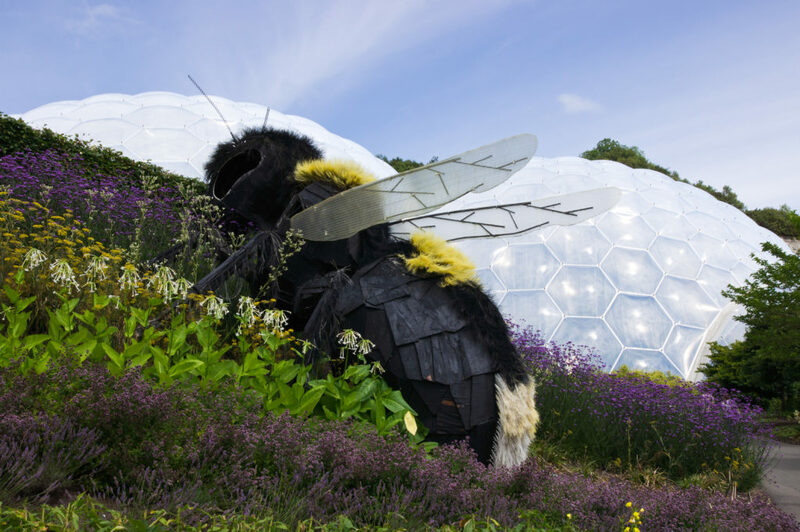 Bombus bee is a large sculpture of a honey bee perched on a flower-blanketed bank within the Eden Project, in Cornwall. The eden project is an artificial haven for nature, with several giant domes housing exotic and tropical plants from across the world. Honey bees are symbolic within the conservation movement owing to their hugely significant role they play for humanity- and the extreme threat they are currently under from mans activities. 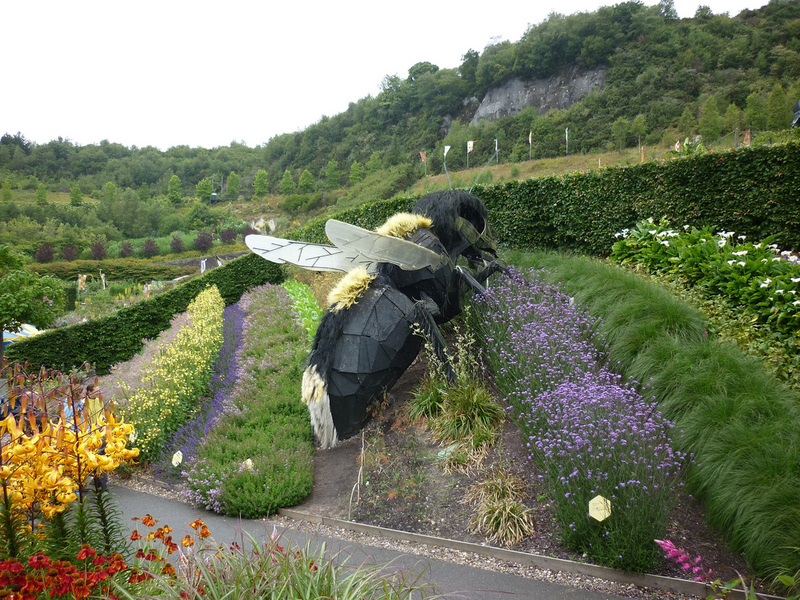 The presence of such a large bee at this location suggests that such creatures can be drawn in by human activity and nurtured instead of harmed, and that by continuing to create havens for nature and creatures such as these, perhaps there is still a chance of creating our own garden of Eden on earth. 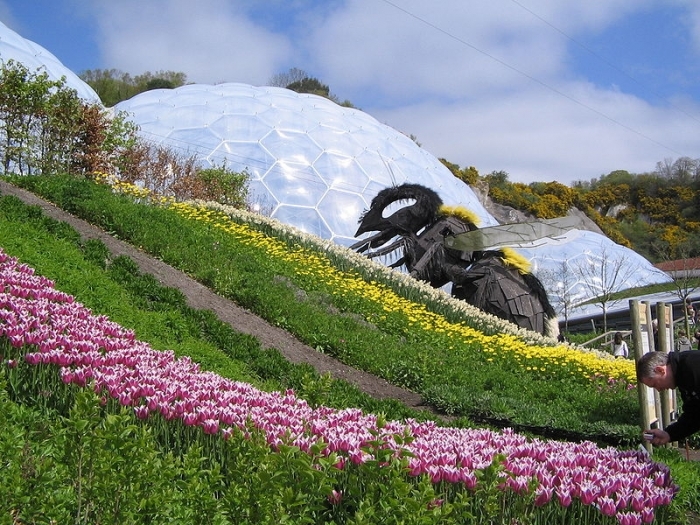 It's monumental size demonstrates the huge importance and the huge threat that the humble bee is under, and it's location amongst blooming flowers and beautiful plants on a patch of land reclaimed and beautified from a previous industrial use is an inspiring message. Work like this, and the garden surroundings that host it, create hope and inspire people to continue working to reclaim and repair nature for both ourselves and the animals we rely on to survive. If we are to undo the damage we have done to our planet, it is the only way forwards. 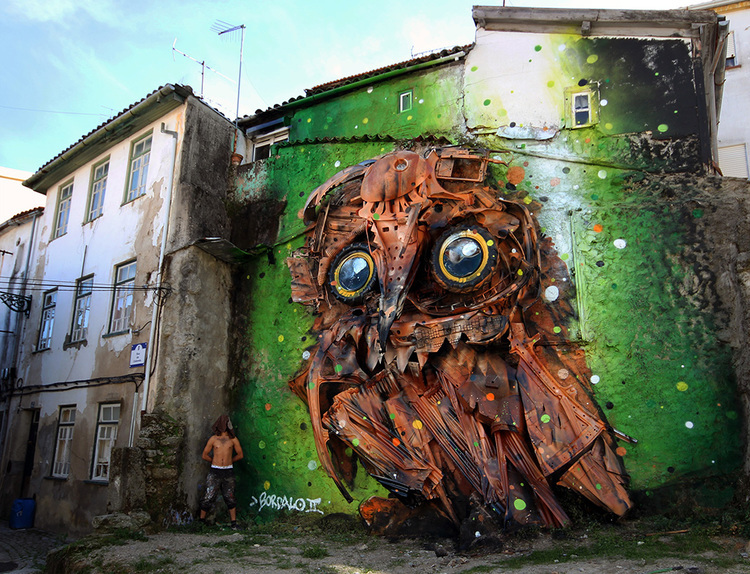 Bordalo II is a street artist from Lisbon, whose work grew from roadside graffiti to city-wide monumental sculpture. 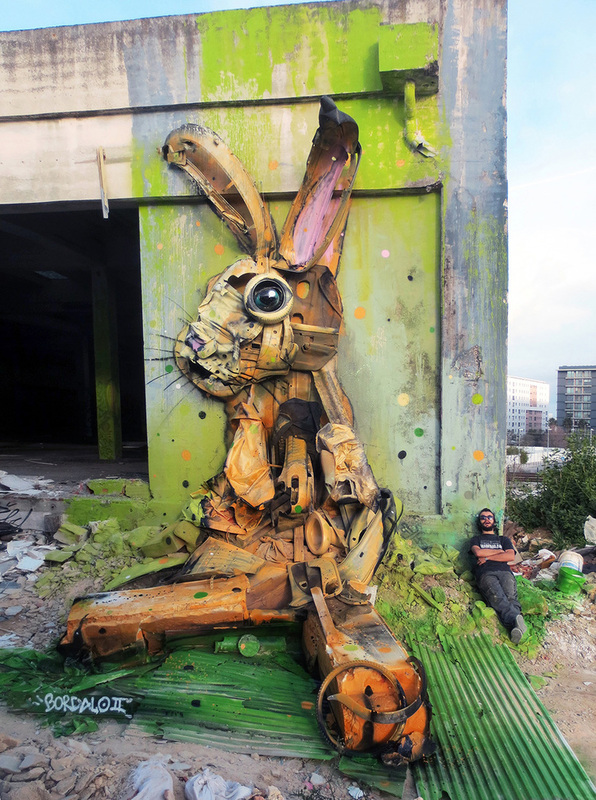 His bright, colourful works are epic in scale and are widely spread across a variety of European cities. 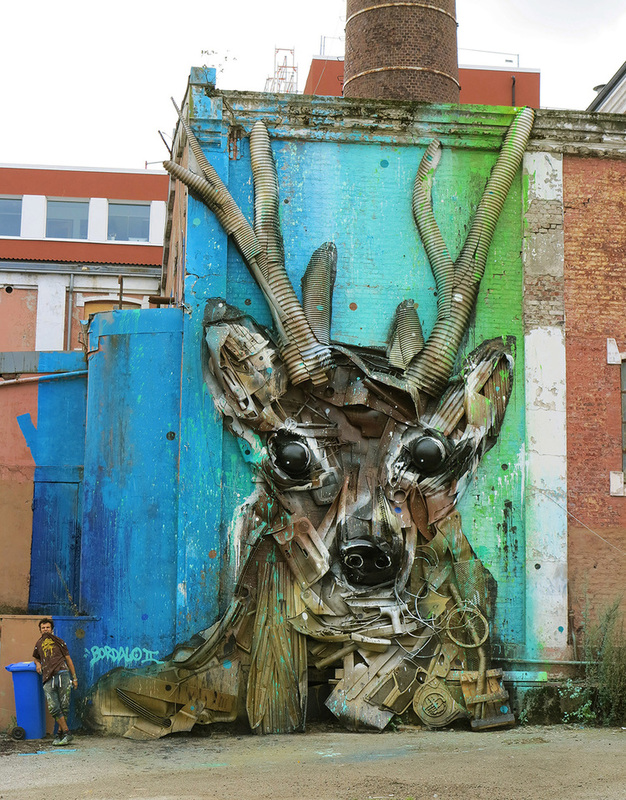 These "Big Trash Animal" works are large murals, built in decaying alleys, spread across tall brick walls, and in open spaces. 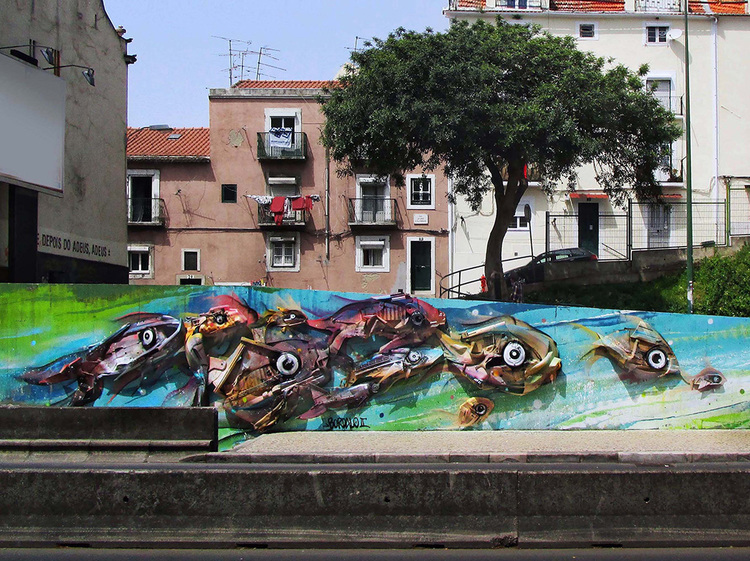 All of them are homages to nature herself, vivid works displayed in areas of drab grey concrete. The bright contrast between the pieces and their surroundings is striking, but even more so is their construction. 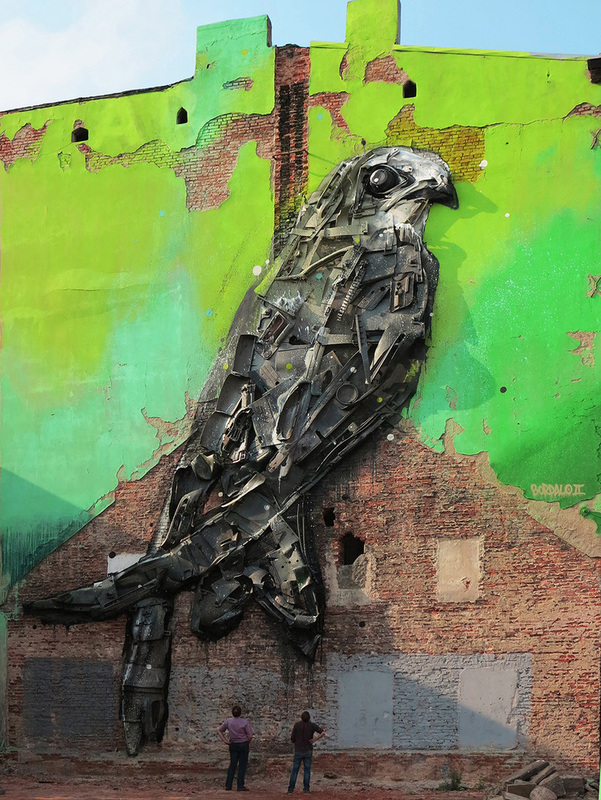 Each of these large animals is constructed from waste salvaged in the nearby area- street rubbish, abandoned cars, large pieces of refuse left on the pavement, derelict buildings and more. Pieces are scrounged and scavenged from these sources and are arranged into a larger animal. Perhaps a creature that would have once been found in that area before it was urbanized, or perhaps a creature which is under threat elsewhere. The large scale and public display of the works seeks to bring to the attention of any passers by the plight of these animals, the threat of urbanization and plants the seed of a plausible and foreboding reality. Perhaps in the future, if humans don't stop consuming and discarding unnecessary things so excessively, and spreading so mindlessly and paving over natural environments, this will be the only way to see nature. 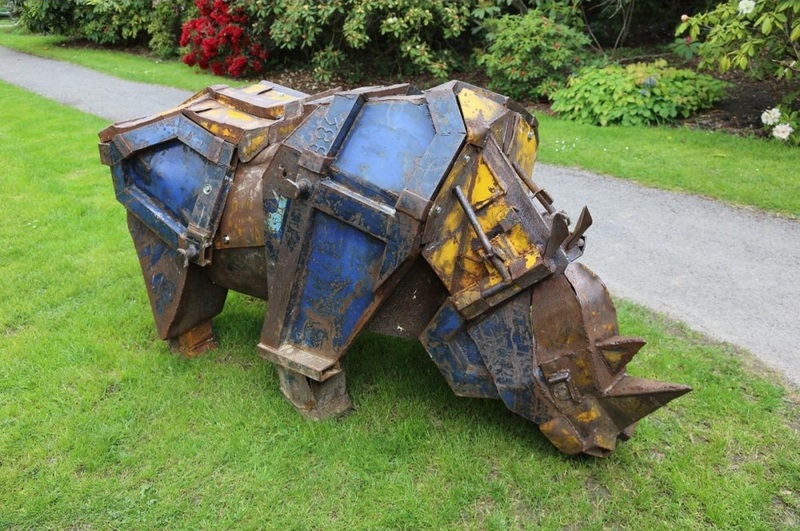 Django is a rhino that has been created from the cut, folded and welded parts of a left over skip. Hardy and strong like a real rhino, this sculptural fascimile of such a rare creature is symbolic of it's plight. At such great risk from poaching and habitat loss, it's almost as though the rhino has been thrown away and discarded by humanity. It's mighty horns and fierce reputation would suggest that such a powerful creature would be able to protect itself, but against mans superior technology and seemingly endless desire for wanton destruction, it stands no chance. This piece of eco art sculpture seeks to address the way in which we see these animals and care for them. 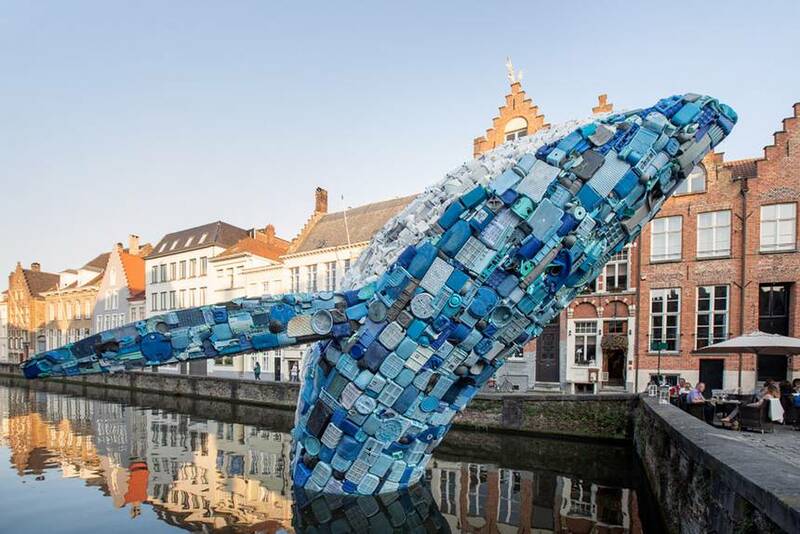 Seeing this majestic creature represented by something as mundane and unpleasant as a rubbish skip, with it's form only roughly created from the chopped up pieces of refuse is a powerful message. This entry was posted in on 15th March 2019 by Charlie.